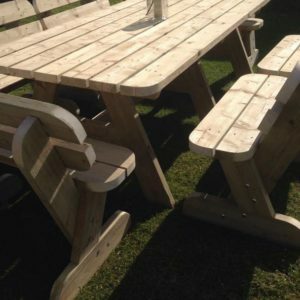 A gorgeous short table, which is ideal for lunch in the garden and sits very nicely in front of our garden bench. 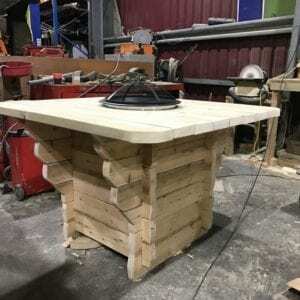 The coffee table is super strong and durable but is small enough to be moved around the garden and even used as additional seating when you have company. We have now extended our popular range of Heavy Duty Tables to include our new of fire pit tables. This table/bar seats 8 people and we can manufacture the heavy duty seating to match this high quality product. It is ideal for outdoor parties to complement your patio furniture and garden buildings. We can make this product in any bespoke design to meet your specific requirements, including seating. Please give us a call on 07969 787208.